An experienced photography professional and writer for photography and travel venues. Many DSLR cameras come with a handy pop-up flash, which can be used to great effect. It is a convenient and quick way to add light to a scene. However, these little flashes lack power, and you need to understand their limitations because they are, admittedly, not the best lighting source. Pop-up flashes do not have the full power range of other flash units. For instance, it will not light up anything a long way from the camera. The light of a pop-up flash is not directional. This can give a flat and somewhat harsh look to the final image. The pop-up flash is so close to the camera body that it can cast a shadow from your lens. This is a concern when using larger lenses like a big-barreled wide angle or a long telephoto and it will appear as a half-moon shadow at the bottom of the picture. However, the DSLR pop-up flash does have its uses. Have you ever tried to take a photograph of someone outside, but you ended up with an image where half the person's face is covered in shadow? The sun's rays cast a large number of shadows, but your small DSLR pop-up flash can easily correct this problem on a head and shoulders shot. Use the pop-up flash to fill in the shadow areas of a close subject. You will end up ​with an evenly balanced shot with the face nicely lit, and good catchlights in the eyes. Plus, the combination of ambient light with the flash will stop the shot from looking flat or looking like one that was obviously lit by a flash. The DSLR pop-up flash is also ideal for shooting creative action shots. By using a slow shutter speed, panning with the action, and firing your pop-up flash at the beginning of the shot, you will be able to freeze the action, while creating blurred streaks in the background. This technique is known as "flash and blur." It is best to choose a subject that you can get close to for this to be successful because the DSLR pop-up flash has a very limited range. You can use the DSLR pop-up flash to take macro (close-up) shots of small things such as flowers. On its own, however, the light from the pop-up flash will be too harsh and flat, and it could bleach the colors from your image. If you manually adjust the exposure of your flash and set it at least a stop lower than your chosen aperture, you will get enough flash to bring the flower out from its background colors without blowing it out entirely. DSLR cameras have a flash exposure adjustment built into them which you can adjust manually. Look for the flash symbol with a +/- sign on the camera body and the option within the camera's menu. When the light of your pop-up flash is too harsh, you can diffuse or bounce the light to make soften it and make the light more appealing. There are a number of diffusion and bounce cards available that are designed to work specifically with the pop-up flash. You can also make your own. Either way, both are good accessories to have in your camera bag at all times. Hold these in front of your flash or rest them between the flash and the camera. A piece of tape may be needed to hold them in place. It is best to use gaffers or painters tape so no sticky residue is left on the camera body. A diffuser is nothing more than a semi-transparent piece of white material that softens (diffuses) the amount of light produced by the flash. A small piece of vellum, tissue paper, wax paper or similar material works great. You can even use random things such a piece of a plastic milk jug as a diffuser. Depending on the material, you may need to adjust white balance and flash exposure to compensate for the diffuser. 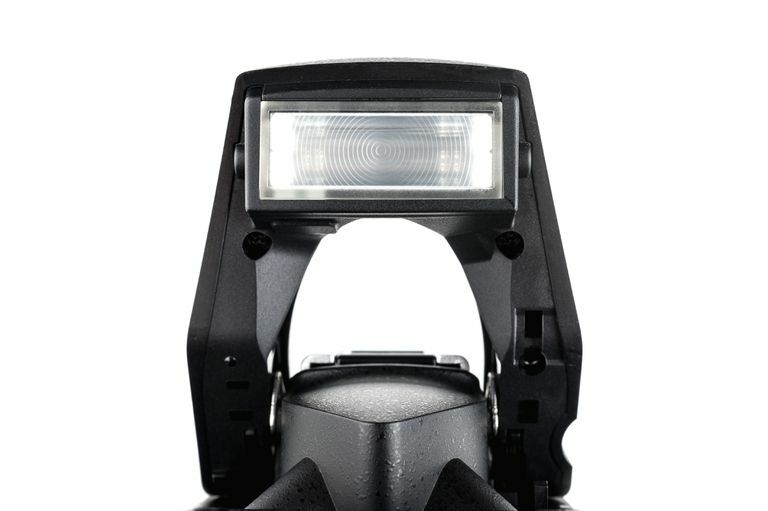 A little experimentation and you will find this to be your new favorite flash modifier. Similarly, you can quickly make your own bounce card to redirect the flash's light away from the subject and onto the ceiling. The light that ends up falling on your subject is less directional and evener. This only works inside or when there is something over your head that will bounce the light back to the subject. It is also difficult to do in a room with very tall ceilings, so it does have its limitations. A bounce card is simply a white opaque piece of thick paper. Index cards, card stock, even the back of a tourist brochure (without too much text) can work and this is a tool that you can scavenge almost anywhere you are at. Be sure that the bounce card is at an angle to the flash so that the light is not blocked. Think of it as a ramp for light and position it where you want the light to go. You will also need to use your flash compensation to increase the amount of light coming out of the flash. 1/2-1 full stop will usually do the trick. As mentioned, pop-up flash has limitations and it should be used selectively. Don't ever try and use a DSLR pop-up flash to photograph a large group of people, as it can't possibly cover that kind of distance. Don't expect the pop-up flash to be able to illuminate even one person at night. In an indoor situation, the pop-up flash will cast extremely harsh shadows, which don't create an attractive shot. Unless you just want a quick snapshot, it's best to limit your use of this tool to the tips listed above.